In the autumn of 1944, as Patton’s army paraded through Paris, another Allied force was gathering in southern Italy. Spearheaded by over 100,000 American troops, this vast, international army was faced with a grim task—break The Gothic Line, a series of interconnected German fortifications that stretched across the mountains of northern Italy. Striving to reach Europe’s vulnerable underbelly before the Red Army, these Allied soldiers fought uphill against entrenched enemies in some of the final and most brutal battles of the Second World War. In At War on the Gothic Line, veteran war correspondent and historian Christian Jennings provides an unprecedented look inside this unsung but highly significant campaign. Through the eyes of thirteen men and women from seven different countries, Jennings brings history to life as he vividly recounts the courageous acts of valor performed by these soldiers facing overwhelming odds, even as many experienced discrimination at the hands of their allies and superiors. Witness the courage of a young Japanese-American officer willing to die for those under his command. Lie in wait with a troop of Canadian fur trappers turned snipers. Creep along mountain paths with Indian warriors as they assault fortified positions in the dead of night. Learn to fear a one-armed SS-Major guilty of some of the most atrocious war-crimes in the European theater. All these stories and more pack the pages of this faced-paced, action-heavy history, taking readers inside one of the most important, and least discussed, campaigns of World War Two. "Jennings's chronicle of one of World War II's least-known campaigns is as thrilling as it is erudite. The author never lets his readers catch their breath: as an experienced war correspondent, he knows what it is like to be close to the fighting and there are moments when you can all but smell the cordite. 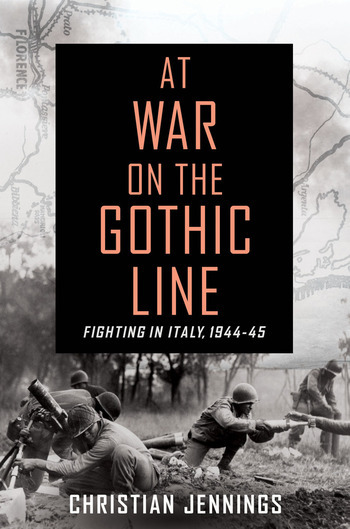 Vivid, enthralling and authoritative, At War on the Gothic Line is military history at its pacy best." —John Hooper, author of The Italians. "This book is fascinating: a vivid and refreshingly new and important angle on the war in Italy." CHRISTIAN JENNINGS has been an investigative journalist, a war correspondent and a history, science and current affairs author for over twenty years, working mainly in the Balkans, Africa and EU. From 1999 - 2012 he wrote for such publications as The Economist, The Daily Telegraph, The Scotsman and Wired magazine. Originally from the UK, he has lived in Kosovo, Bosnia, Macedonia, and Serbia. He currently lives in Turin, Italy.